Catch A Falling Star is a work of dramatic literary fiction penned by author Keith Julius, and forms book one of The CASA Chronicles. Written for adults, the acronym of the series’ title stands for Court Appointed Special Advocate, in this case the dutiful Beverly Stone. Beverly is appointed to help heroin addict Aleisha Turner, a young woman and mother of three who is desperate to escape the vicious trap of drug addiction and return to a normal life with her family. In her CASA capacity, Beverly explores the world of the inner city and learns something about herself and American culture along the way. Though we see these issues on television sometimes, or in sensationalized crime fiction, I have never encountered a book so open and frank about drug addiction as Catch A Falling Star. Aleisha Turner is both hero and victim in this tale, written with great compassion and depth, for whom any audience is sure to have great sympathy, but also be able to understand how she ended up in her predicament. Beverly Stone begins the tale as a proper, officious woman determined to do her job, and the lessons she learns on her personal journey mirror the reader’s own discovery experience beautifully. Keith Julius writes with fluid prose and authentic dialogue for inner city America, bringing to life the literal highs and lows with poignant clarity. Overall, I would recommend Catch A Falling Star as a story that everyone should experience: a real opportunity to live someone else’s struggle authentically. Catch A Falling Star: The CASA Chronicles, Vol 1 is a literary fiction novel written by Keith Julius. Aleisha Turner loved her three kids and was thrilled to be married to her husband, but her addiction was something she had no control over. It seemed to symbolize her life in some essential way. She had no control over what happened from day to day but giving in to the compulsion to use heroin made all the stress and turmoil go away, leaving only the supreme feeling of power and jubilation. That night, however, something went wrong. Her supplier’s product was different, leaving Aleisha feeling disoriented and out of it. Her husband’s irritation at her late night out was heightened when he saw her come home with her clothing disheveled and barely noticing her young son, Willard, on the stairway in front of her. Angry words turned into a physical confrontation, but it was Willard who realized that his mom was in real trouble and shouted to his step-dad to get her help. Aleisha’s skin was damp and cold, and she had stopped breathing. Catch A Falling Star showcases the work of the Court Appointed Special Advocate (CASA) Program’s volunteers whose efforts ensure that kids get the necessary support and care while they are away from their parents, and assist in helping the parents get the treatment or education they need to regain custody of their children. In this novel, we follow the efforts of Beverly Stone, a retired teacher and widow, who becomes Willard and his siblings’ advocate, and works with Aleisha and her husband to help reunite the family. Julius’ plot is riveting and heartbreaking all at once. The reader is instantly involved in Aleisha’s situation and witnesses her recovery while in rehab. Beverly Stone is a marvelous character who, despite knowing she should not get involved, can’t help but do so. Watching her dedication and caring attitude made me feel a bit better about those scores of kids, like Willard, who are in foster care, and learning about CASA and the volunteers who make it all happen was inspirational indeed. I’m looking forward to the next volume in this series. Catch A Falling Star: The CASA Chronicles, Vol 1 is most highly recommended. There could not have been a better title for this moving book by Keith Julius. 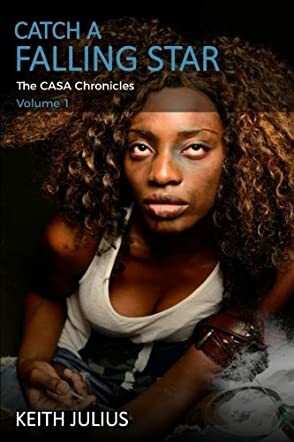 Catch a Falling Star: The CASA Chronicles Vol 1 revolves around the life of Beverly, who is a CASA - Court Appointed Special Advocates - worker, and Aleisha Turner, a mother of three beautiful kids and a heroin addict. Aleisha was married to a man named Mark, who is the father of one of her kids, Michael. The location of the father of her other two kids, Nataya (6 years old) and Willard (8 years old) was not known or mentioned. Aleisha turned to prostitution from time to time in order to get her daily fix. One day, when she returned home all high on heroin, Mark realized that she had been sleeping around to get the money for her drug supplies. Long story short, he lost his temper and hit Aleisha so hard that she fell on the floor. When Willard realized that she wasn't breathing, she was admitted to the hospital. She had passed out due to a heroin overdose. This action started a chain of events that brought Beverly and many other CASA workers into their lives. Willard and Nataya were now living with foster parents until Aleisha turned her life around by being in Rehab and later proving her ability to stay off drugs. Michael remained in the custody of Mark's sister, Mary. Since Beverly's main responsibility was to ensure that the kids were getting proper care, she visited the foster parents, Mary, and everyone involved in the lives of the kids. We all know and talk about heroin and other drug problems; however, how much do we really know about the lives of the people affected by it? in Catch a Falling Star, author Keith Julius has done a commendable job of showcasing the life of an addict with respect to everyone surrounding them. The more I read about Aleisha's life, the more assured I became of the fact that we all look for acceptance. It's easy to label people as addicts and then put all the blame of their problems on their shoulders; the tough part is to truly understand where they're coming from. The conversation between Beverly and her daughter, Jennifer, on this topic is quite thought-provoking. Jennifer, like most of us, labels the addict as a loser, whereas, Beverly, thanks to her experience as a CASA worker, discards this label and explains to Jennifer that we don't know what they went through. The characters and their dialogues are extremely realistic. Once I started reading, it was hard to put this book down. Stories like Catch a Falling Star remain in our hearts long after we are done reading them. There are so many lessons and emotions in this praiseworthy book that it will definitely remain in my memory for a long time. I would recommend it to readers who appreciate an emotional story that targets a social issue with empathy.